Have you ever wondered how one of the most important organs in your body, your immune system, works? The immune system evolved to protect against a wide range of pathogens, including viruses, bacteria, parasites and other microorganisms as well as internal threats like tumor cells. A healthy immune system has several layers of complexity but can be broken down into two main divisions, each with its own special function. You depend upon both of these components for protection against pathogens each day. That’s why a strong immune system is so important for health and well-being. What happens when a bacteria or virus tries to enter your body? Your first line of defense against invaders is the more primitive of the two divisions of your immune system, the innate immune system. 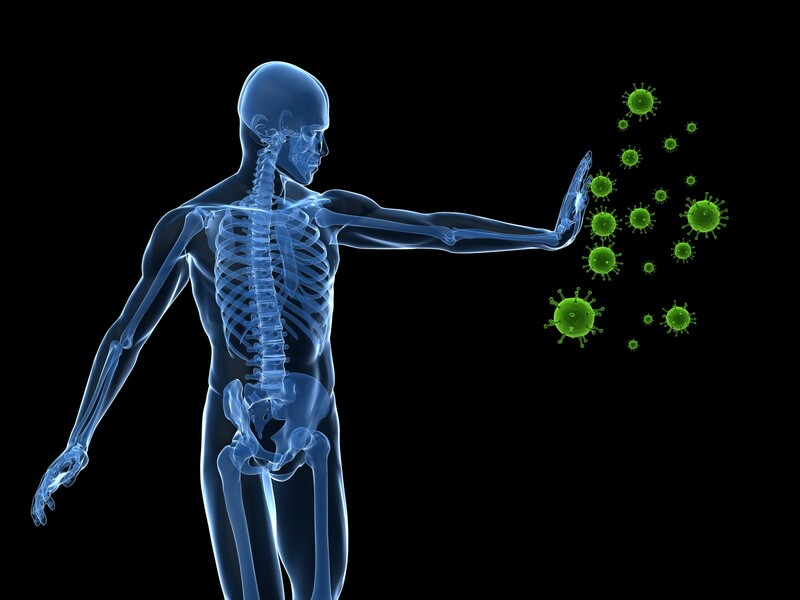 The innate immune system acts as a physical barrier that helps keep pathogens from getting into your body. Good examples are your skin and the mucous membranes that line your throat and nasal passages. As the name suggests, the innate immune system is present at birth. One part of your innate immune system is visible from the outside – your skin. Skin and mucous membranes act as a barrier that blocks pathogens from entering your body, but these tissues also produce chemicals and proteins that help block the growth of bacteria and viruses. For example, your nasal passages make mucous, a sticky substance that traps pathogens, and the surface of your skin is acidic enough to reduce bacterial growth. If you happen to cut your or scrape your skin and the barrier is broken, your risk for infection goes up. Also, secreted through tears and sweat is an enzyme called lysozyme that kills bacteria. Another part of the innate immune division are cells that kill foreign invaders in a non-targeted way. These consist of white blood cells, including cells called macrophages that engulf foreign pathogens, and natural killer cells that attach to pathogens and cancer cells and release proteins that injure them, and, hopefully, stop them from replicating. Some of the white blood cells in the innate immune system release chemicals called cytokines that attract other white blood cells to the area to fight “bad guys.” The only downside to these cytokines is they can damage normal tissues if they’re released for too long, for example, when an infection becomes chronic. That’s why immune system balance is critical. Finally, proteins called complement are released as part of the innate immune system. Complement proteins can kill bacteria directly, attract other immune cells to the area and enhance the effectiveness of other components of the immune response. As you can see, these proteins are multi-talented. The downside to the innate immune system is the response is non-specific and the cells involved have no ability to remember pathogens they’ve already encountered, unlike the acquired immune system. The acquired division of the immune system is the “smarter” component. It’s this portion of your immune system that “learns” and remembers. The main players in the acquired immune division are lymphocytes, specialized white blood cells that recognize bacteria and cells infected with viruses once exposed to them. The two main types of lymphocytes are called T-cells and B-cells. B-cells are cells that produce antibodies, proteins that bind to pathogens so they can be destroyed. Once a B-cell encounters an invader, it remembers it. If it comes into contact with it again, it can quickly make antibodies against it. T-cells come in several different varieties including cytotoxic T-cells that kill cells infected with viruses and helper T-cells that help other immune cells do their job. A third type called suppressor T-cells help to keep things under control so the immune response doesn’t get out of hand. T-cells are produced in a small gland called the thymus that plays a critical role in immune health. Once produced, they hang out in the lymph system, spleen and parts of the small intestines. Like B-cells, T-cells can “remember” foreign invaders they’ve dealt with before and respond quickly if they re-encounter them. Your immune system is beautifully choreographed and capable of quickly responding to pathogens and tumor cells. The key is to keep it healthy through healthy lifestyle habits, including good nutrition, and with the supplements proven to fortify and boost your immune system. The supplement that is unlike any other supplement is BioPro-Plus™. This supplement is so effective because it acts with the “smart” side of your immune system, the acquired side. It works by giving your body the bio-identical protein made by your thymus gland. GET YOURS TODAY and start restoring your immune system to the way Mother Nature intended! Enjoyed the article. Having Sarcoidosis, Osteoarthritis, had the pylori virus, COPD, Severe sleep apnea so, information immune system is a very interesting subject.